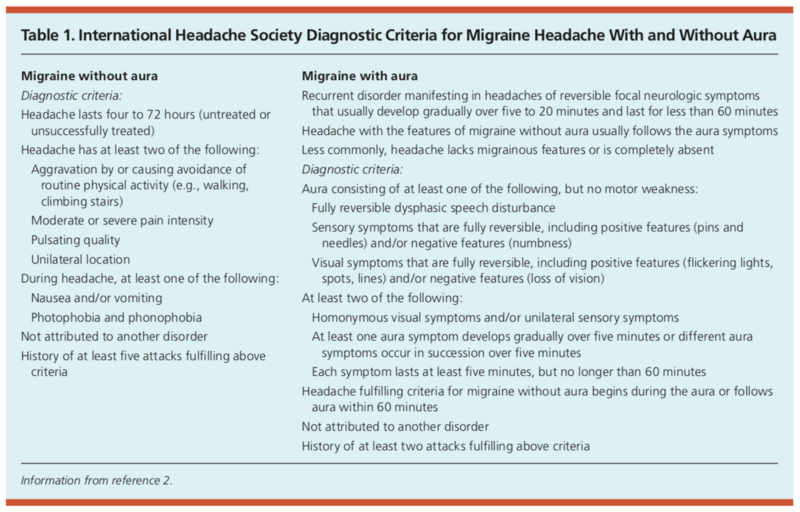 The International Headache Society has made diagnostic criteria for migraine headaches without an aura. These are listed in the table below. Regarding the diagnosis of migraine headaches, one should start by completing a full history and physical examination. This can aid in ruling out emergent or life-threatening diagnoses. The mnemonic POUND can be used to describe the symptoms and diagnostic criteria for migraines. There are numerous classes of medications that can aid in the treatment of acute migraines. These range from over the counter medications to several prescription medications, as below. Unfortunately, there have not been many head to head studies comparing the myriad of treatment options for migraine headaches, so there is no hard-fast data, or algorithm to treat these headaches. The U.S. Headache Consortium supports the below process for treating acute migraine headaches. 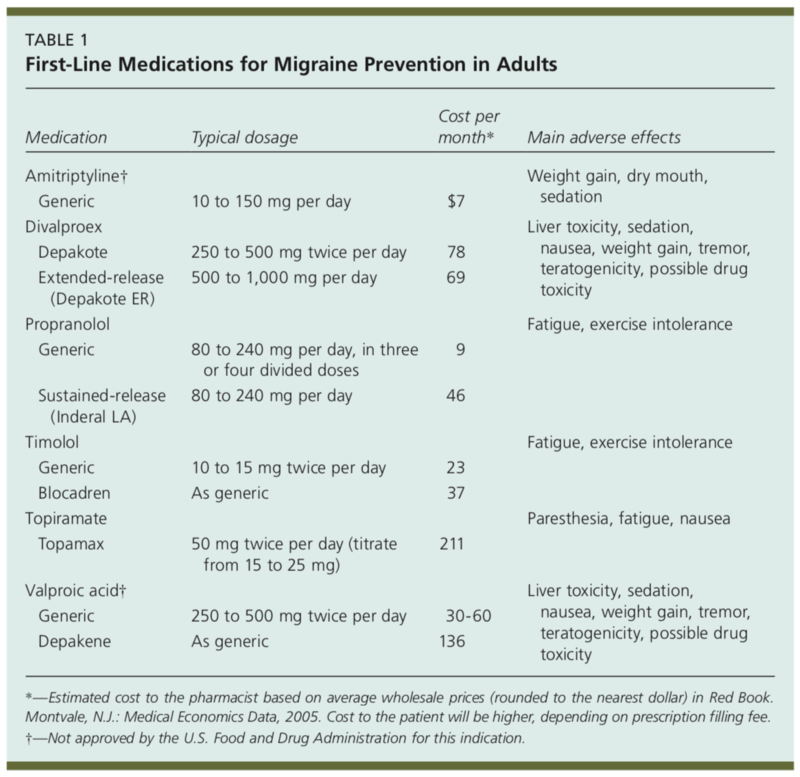 First line therapy for acute migraines includes combination analgesics, NSAIDs, and triptans. The combination of acetaminophen/aspirin/caffeine (Excedrin Migraine) has been found to be an effective first-line treatment for migraine headaches. It is inexpensive, there is no prescription needed, and there are no contraindications for use in patients with vascular conditions. This medication has been shown to be just as effective as Sumatriptan, 50 mg in some patients. If a patient gets modest benefit with a specific triptan, the dose can be titrated up based on dosing recommendations. For those who do not respond to one triptan, you can trial a second medication in the class to see if benefit can be gained. Another differentiating factor between triptans is the route of introduction of the medication. Some are available as nasal sprays, injectables, or rapidly dissolving tablets. This may be something that needs to be taken into consideration on a patient by patient case. 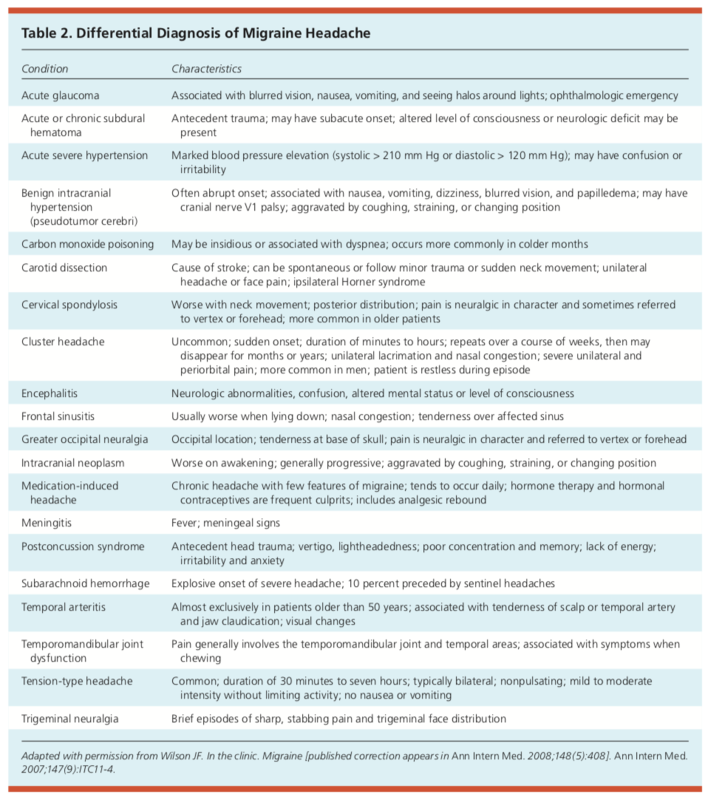 Unfortunately, due to triptans causing vasoconstriction, patients with ischemic heart disease, uncontrolled hypertension, stroke, or hemiplegic or basilar migraine, these medications are contraindicated. If a patient is taking triptans and starts to have cardiac symptoms, the medication should be discontinued until further workup is completed regarding their cardiovascular health. Prior to initiating treatment with triptans, if a patient has multiple risk factors for coronary artery disease, a workup to evaluate their cardiovascular health is reasonable. Triptans are additionally contraindicated in patients taking MAOIs and combining triptans with SSRIs should be done cautiously due to the increased risk of precipitating serotonin syndrome. In addition to triptans as monotherapy, there is a combination of Sumatriptan/Naproxen, 85/500 mg called Trexima which can be used as treatment for an acute migraine. However, it would be cheaper for a patient to just take their triptan and OTC naproxen as opposed to prescribing a combination. Along with the aforementioned first-line treatment options for acute migraine headaches, there are several other useful add-on therapies. Dexamethasone IV or IM has been used as an adjunctive therapy for migraine headaches. Trials have seen that with the addition of dexamethasone there has been a reduction of rebound migraine headaches within a 24 to 72-hour timeframe. Ergotamines are another migraine-specific medication that binds to serotonin receptors. There is little evidence for oral ergotamine use due to poor absorptions and high risk of adverse effects. Combination of ergotamine with caffeine (Cafergot) has been seen to have less adverse effects than ergotamine monotherapy. However, in head to head trials between ergots and triptans, the latter has been shown to be more effective in relieving migraine headaches. Intranasal lidocaine has been found to have a quick onset of action and can be used for quick relief of acute migraine headaches until long-acting medication can provide benefit. Lidocaine 4 percent solution can be given intranasally which provides rapid relief. Unfortunately, if you are only using this medication, quick return of symptoms will occur. Non-preferred therapies for acute migraine treatment include monotherapy with acetaminophen and butalbital/aspirin/caffeine due to the increased risk of rebound headaches. Current research is being done on calcitonin gene-related peptide antagonists as IV therapy for resolution of acute migraine symptoms. One trial has been completed with promising results. Transcranial magnetic stimulation, where a magnetic field is generated on the scalp to create currents in the nearby cortex seems promising as well.1 However, more trials and studies need to be completed on both of these options for migraine treatment. A question that you may have is, when do we start treating to prevent these migraines as opposed to treating them when they occur? The U.S. Headache Consortium recommends starting prophylactic therapy when a patient has more than four migraines per month. 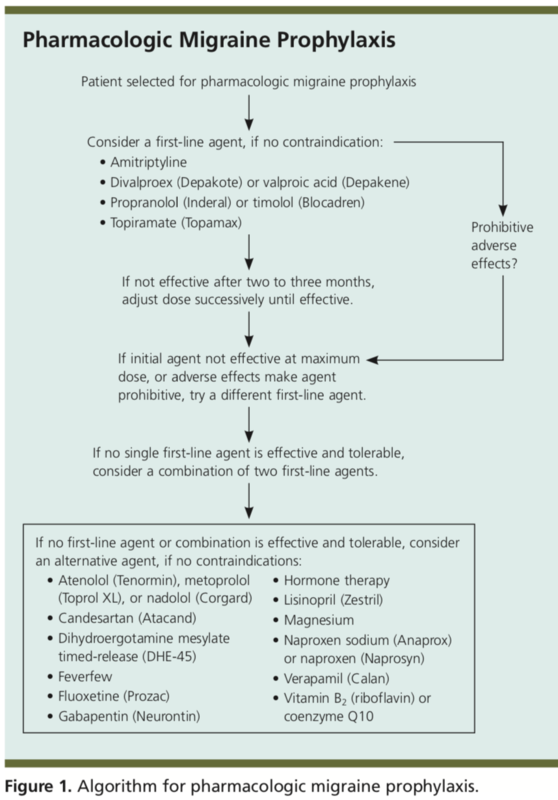 There are several medications for prophylaxis including SNRIs, TCAs, Depakote, beta blockers, topiramate, and Valproic acid.2 A full list of medications as well as an algorithm for prophylactic treatment of migraines is listed below. If you have tried multiple different classes of medications for prevention and still are not making progress on a patient’s symptoms, neuroimaging with a CT of the head or MRI of the brain without contrast should be considered to assess for intracranial pathology (like a patient in my clinic last month with a Chiari malformation!). Referral to neurology for further evaluation and treatment is appropriate at this time as well. 1. Am Fam Physician. Treatment of Acute Migraine Headache. 2011;83(3):271-280. 2. 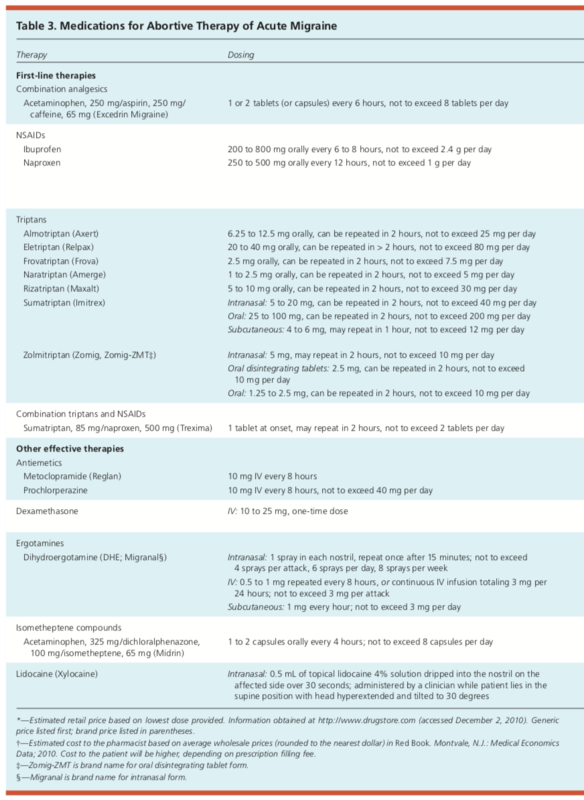 Am Fam Physician Medications for Migraine Prophylaxis. 2006;73:72-8, 79-80. 3. Ferri’s Clinical Advisor, Migraines. 2017. 4. Family Practice Notebook. Migraine Headaches. Accessed: February 2, 2018.